And while this formula finds its way onto PM computer screens and chatrooms across Silicon Valley, it can be tricky to know how to use it correctly. How often do you measure customer retention? Should include free trialers? What should your target number should even be? You know what customer retention rate your company should have. You're able to quantify and understand progress. If you neglect any of these things, you could end up making uninformed and potentially detrimental product decisions. But if you nail it, you'll have a clear picture of the current state of your company and be better equipped to set your product up for long-term success. Customer retention is incredibly important and slightly different from user retention rate, so we want to deliver advice on how to measure it as clearly and carefully as possible. For the purpose of this article, “customers” means subscribed users. To fall into this category, a user must be subscribed to your product, and have made at least one payment (if you're offering a paid service). Subscribed customers are different from active users. Inactive users are still paying customers who can always be re-engaged, but churned customers are not. Subscribed customers also do not include people who are trialing your product. A free trial is a marketing strategy, so it cannot be used to measure the health and longevity of your product. A customer only becomes a customer once they've paid you. 90% of the users who churn before paying a cent don't have the same impact on your bottom line as 90% of paying customers churning. How is customer retention achieved? What gets measured, gets managed. To unlock the secrets to customer retention, we have to first measure it precisely. Here are 3 tips to making sure your CRR is set up correctly. The numbers 5-7% have been floating around blogs and have given rise to the myth that a monthly churn of 5-7% is acceptable for all startups. Depending on the type of company, a 5-7% churn rate can be great annually but troublesome monthly. 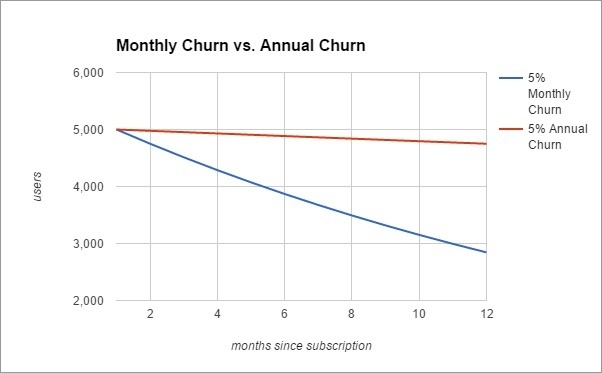 A 5% monthly churn means 46% annual churn. A 10% monthly churn amounts to an annual churn of 72%. Of course, your retention will shift month-to-month, but it's really to show the magnitude of a seemingly low monthly churn rate. The age of your company. As you're figuring things out, your churn rate is going to fluctuate. You don't have a substantial enough user base to give you an accurate understanding of the traction of your product. Start by flattening your retention curve and getting a consistent churn number. Then try to lift it every month. If you can hit these numbers, then you have a thriving, successful company. But it takes time—if you're still in year 1 or 2, don't fret if you're not hitting these metrics yet. Customer retention is an uphill battle, so as long as you have a great product and you know to focus on engagement, great retention is attainable. An analytics tool can't repair rotten processes or keep you from misinterpreting data, but it can do a lot of the heavy lifting for you. No matter what kind of product you have—mobile, desktop app, or even an e-commerce platform—there's a tool out there that will help you get clear, human-error free numbers for when you measure customer retention. 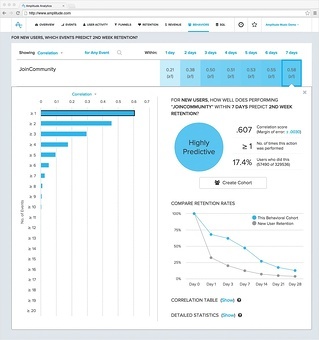 Apptimize is an analytics platform that concentrates on all-things-mobile. Their particular expertise is A/B testing and feature flags to improve engagement and overall retention, without having to redeploy. As such, Apptimize lets you see any and all of your retention metrics in real time, and set incremental goals to lift engagement and prevent churn. Kissmetrics is one of the most popular analytics platforms for web and mobile, and for a good reason. They assign each user a unique ID and let you group users together based on any number of behaviors (so you can define customer as paid user). Not to mention, they're easy for your dev team to implement, thanks to their extensive documentation. Amplitude is also a jack-of-all-trades analytics platform that's especially great for companies that have a larger user base. Their software is built to scale—capable of handling billions of monthly events. We especially love their Compass feature, which helps you identify correlations between behaviors and retention numbers. 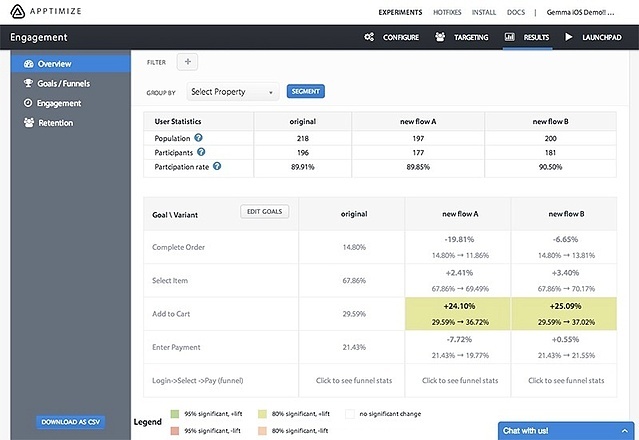 Using an analytics platform not only will give you an accurate number when it comes to retained customers, but it'll also give you the opportunity to lift retention by pinpointing where product changes will have the greatest impact. This period vs. goal. Don't just keep that target churn amount in mind—also set incremental goals. It's too difficult to motivate a team of people to strive for a lofty goal, so aim to reduce churn just 1% a month, and based on your ability to hit that benchmark, adjust. This period vs. previous period. This is great for A/B testing things like onboarding or feature announcements. But it's not terribly useful to compare short periods back-to-back as indicators of overall progress. Too many factors—billing periods, holidays, etc—can affect any one single week or month. This period vs. same period last year. You can see whether your product has gotten stickier since last year because of your shedding factors like seasonality, or budget decisions. In the daily grind, it's often easy to lose track of big picture trends, so do this to compare your performance to how it once was. When it comes to deciding how long a period you should measure, take into account the age and stability of your company. If you've had a stable customer retention rate for a few years, you can compare year to year to see whether there are long-term improvements. But if your business is only two years old, it doesn't make sense to attribute notable changes to anything more than the natural maturation of your startup. Customer retention is the indicator that everything is either peachy, or needs improvement. But understanding how to correctly measure customer retention rate is only step one, which helps you determine the urgency of a churn problem. Understanding how to fix it is a whole other animal. Ready to fix it? Check out some of our other posts on how to pinpoint your churn problem and make laser-focused improvements. Reducing your churn rate isn't about putting out fires—it's about helping your customers find value with your product sooner. How to go beyond multichannel strategies to create a cohesive onboarding experience that shortens TTV and helps new users find success. AARRRn’t you so glad we built a model to compare the impact of each pirate metric on MRR?